Charging car batteries? Is it really necessary? If so, how often and for how long? Aren’t modern batteries maintenance-free? Many drivers have asked these or similar questions. Firstly: normally the alternator should adequately charge the battery in everyday use. However, there are situations in which recharging and other care can have a positive effect on the life of a car battery. For example, this is advisable for the use of conventional lead-acid batteries in combination with short journeys, especially in cold weather. The same applies if the vehicle stands in the garage for a long period. Modern, maintenance-free batteries have the advantage that it is no longer necessary to top them up with distilled water. In order for a car battery to perform reliably, a good charge level can be ensured by the use of car battery charger. Important: Care is essential when handling lead-acid accumulators. With incorrect handling, the electrolyte in a starter battery can escape or splash. Overcharging can produce explosive hydrogen. If an older vehicle is not equipped with a maintenance-free battery a visit to a workshop is recommended. Important: Regardless of this, protective glasses and gloves should be worn when servicing, removing or installing the battery. To prevent short circuits, it is essential to avoid connection of the terminals by contact with metallic or conductive materials, as otherwise there is a danger of electric shock or physical injury. However, with proper and careful handling, all drivers can charge the battery themselves. Charging of the battery in the vehicle is simpler and is preferable for safety reasons, although this is not always possible. If no garage or an electricity connection is available, there is often no alternative to charging the battery outside of the vehicle. Ensure good ventilation when charging in enclosed spaces. 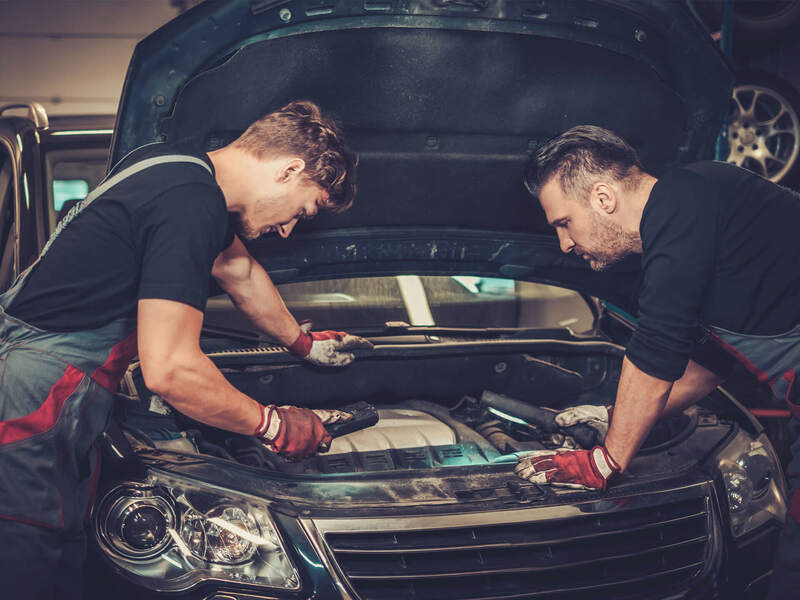 If the battery is removed from the engine compartment for charging, a second person should help to lift large batteries due to the heavy weight. Important: With lead-acid batteries, the formation of explosive hydrogen and de-gassing must be expected during charging. In extreme cases, a high concentration of hydrogen may result in an explosion with serious injuries and damage. Defects of the battery should also be noted. Acid may leak from damaged batteries. Physical contact with battery acid can cause serious burns. The affected area must be thoroughly rinsed with clean water and a physician must be consulted immediately. Important: The cable which is connected to the negative terminal must be disconnected first. This prevents a short circuit between the positive terminal and ground. Then disconnect the red cable which is connected to the positive terminal. For lead-acid batteries which are not maintenance-free, we recommend that you visit a workshop. Under no circumstances should you check the acid-water level yourself. With maintenance-free batteries, checking of the electrolyte is not necessary. Here, only the dirt needs to be cleaned from the vent pipes. Regardless of the reason for charging (for example in the case of a dead battery, long standstill times, short journeys), it is advisable to have a battery test carried out by a workshop from time to time. This is the only way to ensure that your car will always start. According to the German ADAC, more than 40 percent of all breakdowns are caused by poorly maintained batteries. 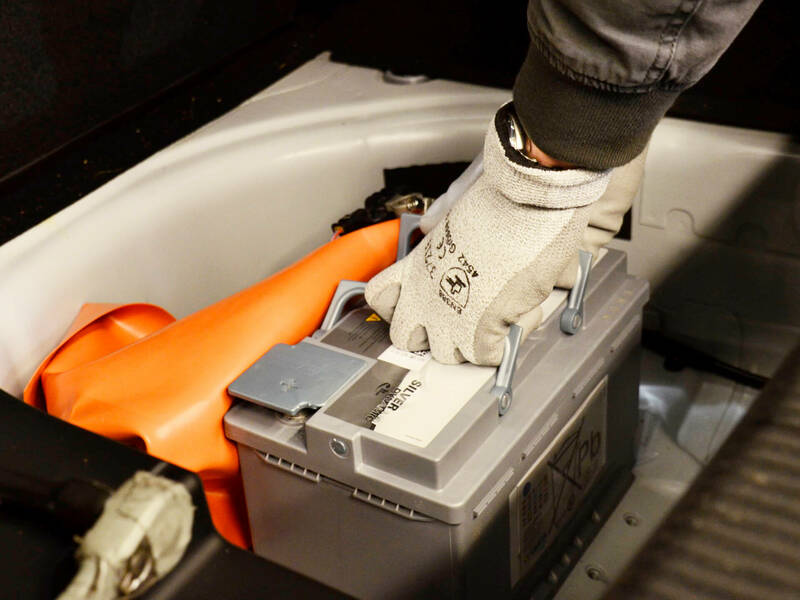 Important: If the battery has to be removed from the car for charging, care must be taken to keep the battery upright when lifting and carrying it. If the battery is to be charged in the vehicle, all electrical consumers must be switched off before connecting the charger. Important: The charger must be connected to the battery before it is connected to the mains. To connect the charger to the battery, first fasten the red cable to the positive terminal of the battery. Then connect the black cable to the negative terminal. Important: The next procedure depends on the type of battery. To select the correct operating mode, the user should follow the information in the operating instructions for the charging device. After the end of the charging process, the charger is first disconnected from the mains before the cables are disconnected from the battery. When installing the battery in the vehicle, the red cable must first be connected to the positive terminal. Then, the black negative cable is connected to the negative terminal. Charging of a battery with EFB or AGM technology is identical, however, care must be taken that the device is suitable for batteries with start-stop technology. In this case, the information in the operating instructions should be followed. Many high quality chargers are compatible with various types of battery and switch off automatically when charging is complete. Intelligent chargers gradually shut down as the charge level increases and limit the current automatically. In this way, a good sate of charge can be ensured even with long standstill times and low outside temperatures. In case of doubt, consult the description of use by the manufacturer of the device. Proper and regular use of battery chargers can therefore increase the reliability and the service life of the battery. Even though there is no risk of overcharging with the use of a high quality charger, the battery should not remain connected to the charger for more than 24 hours. A full charge is usually achieved by charging overnight. In maintenance mode, batteries can be kept at a high charge level even with long vehicle standstill times. Even after a deep discharge, some chargers enable at least partial reconditioning of the battery. Important: Even though the connection and operation of the charger is not complicated, several points should be noted. Charging a car battery differs in several aspects from the charging of a conventional battery. The operating instructions for the charger provide all the necessary information.